Douglas graduated from Hornsey Art School, later called Middlesex Polytechnic, London, in 1976 with a BA Hons in Fine Art. He had the good fortune to receive a year’s French Scholarship to Les Beaux Arts in Aix en Provence in the same year, where he explored the new and refreshing Mediterranean light and landscape. After returning to England to complete a year’s postgraduate teaching degree from Leeds University in ’77, the first taste of the Mediterranean drew him back to develop his painting and drawing. This time he travelled to Italy in a combi van with 100 pounds in his pocket, and armed with paints, brushes and easel, he discovered another world of stimulating and inspirational images. This valuable time also allowed him to learn the language better and meet other artists. On the streets of Bologna, Florence and Venice, and around Tuscany, Douglas attempted his first tentative drawings and watercolours, learning much to do with light, drawing, colour and the new experience of painting from life, old cities and the landscape. It was an invaluable experience and it helped form a solid foundation for his painting career, and the confidence to live from painting. Travel and the sense of adventure led him to Australia in 1982, where he continued to paint to fund his travels and discover a new country. It was a different challenge to interpret the vastness of the landscape, its light and colours all of which contrast with those of Europe. This is where he wanted to “hang his hat”. After starting married life in Fremantle in 1984 where his two daughters were born, he moved to the Yallingup area in 1991 and established a home and studio where he continues to work full time at his painting and the challenges of interpreting this country’s contrasting landscape. Since 1985 Douglas has travelled many times to the north to paint including the Pilbara, Kimberley, Murchison as well as the Northern Territory . The north will always have a fascination and be an endless source of inspiration. The timeless, vast and spiritual nature of its land has a power which has not been felt anywhere else. The immediate surroundings of his home, the bush and the rugged beauty of the coast, are also the inspiration for his art. 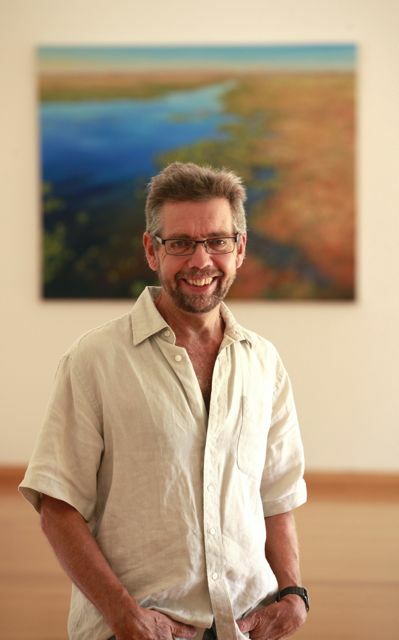 His work is represented locally at Yallingup Galleries and in Perth at Linton and Kay Galleries. Douglas’ paintings hang in private and corporate collections in Australia and throughout the world. The experience gained in the formative years of painting and drawing from life has helped train my eye to observe. My work is often about light and how it falls on landscape. The landscape forms the basis of my subject matter whether figuratively or simply exploring its abstract properties. The ancient qualities and size of Australian landscape also contribute to the challenge of interpreting it through painting. My art is expressed through the language of painting by my reaction to a visual experience. It may be landscape, the play of light over a subject, the movement of water, the colour of rock, but I am compelled and inspired to put it down on paper or canvas and develop it further in the studio. The process and purpose of making art is my way of reasoning my position in the world whose beauty I attempt to reflect and capture. B.A. (Hons) Fine Art- City & Guilds & Hornsey Art School, London. 1 Year French Scholarship, Ecole de Beaux Arts, Aix en Provence. 1 Year Post-graduate Art Teacher’s Certificate, Leeds University. Traveled and painted in Italy, France and Austria, specialising in watercolours, landscapes and portraits. Arrived in Australia, March 1982. Traveled and painted widely until September 1984. Gained permanent residency in Australia and started painting full-time. Paints Pilbara, Kimberley, Northern Territory, Settled in South West of Western Australia. Subsequent painting trips made to Nepal and Europe taking in Tuscany France and Portugal. 2 week Painting and Teaching trip to Lucca, Tuscany. 3 week Painting and Teaching trip to Greece. Winner of Vasse Primary School Art Exhition. Cossack Art Award, Pilbara Landscape Category. Joint Winner Vasse Primary School Art Prize. People’s Choice, Cossack Art Prize. Finalist for Mandorla Art Prize. Wild West Hyundai Art Prize, Gillian Aitken Award. Katanning Art Prize, Water based Medium. Subiaco Rotary Art Club Prize. St John of God Hospital Bendat Cancer Centre, Subiaco, Western Australia. Private collections in Europe, USA, Israel, Australia. Linton & Kay – Shenton Park, Perth. Monsoon Galley – Broome, WA. Monsoon Gallery – Featured Artist – Broome, WA. Moonsoon Gallery – Broome, WA. Delshan Gallery – Armadale, Victoria. Monsoon Gallery – Broome WA. Stafford Studios – Perth WA. Monsoon Gallery – Broome, WA. Evans and Tate Wines Visitor’s Centre Opening – WA. Stafford Studios – Perth, W.A. Gunyulgup Galleries – Yallingup, W.A. ’Pilbara Light’ Exhibition, His Majesty’s Theatre, Perth. Stafford Studios – Cottesloe, WA. Yallingup Galleries Garden Art Studio – WA. Gecko Gallery – Broome – WA. Monsoon Gallery , Broome, WA. Abney Gallery New York, N.Y. Relief Print Portfolio, "Western Sight", Perth Galleries. Two Man "Festival of Perth", Editions Gallery, Fremantle. Group Shows in Perth and Fremantle. Douglas has been represented by Linton & Kay since 2011. Douglas has been represented by the Yallingup Galleries since 2000. The experience gained in the formative years of painting and drawing from life has helped train my eye to observe.